President Donald Trump’s approval rating is now exactly the same as that of former President Barack Obama at the end of his first year in office. The poll conducted by Rasmussen Reports found that 46 percent of respondents approved of President Trump’s performance while 53 percent did not. These are exactly the same numbers that Obama received on Dec. 31, 2009, at the end of his first year in office. Forty-six percent at that time approved of Obama’s performance, while 53 percent did not. 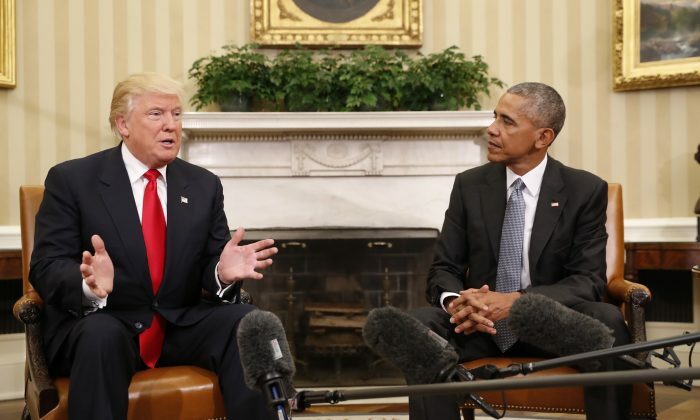 The big difference between Trump and Obama, however, is the nearly non-stop negative media coverage Trump has received. The media bias against Trump was documented in research published by Pew Research Center in October. “The evaluations of President Trump were far more negative and less positive than those of his predecessors,” wrote the Pew Research Center. Besides negative media reporting, Trump has also faced unproven accusations that he had conspired with the Russian government to win the election, which are likely to have affected his approval rating. Despite a year of investigations into the accusations, no proof of collusion has been found as of yet. What has been revealed, however, is that the dossier which first alleged the collusion was paid for by the Clinton campaign and the Democratic National Committee. The company behind the dossier, Fusion GPS, had commissioned former British spy Christopher Steele and his UK-based company Orbis Business Intelligence to produce the report on Trump. The 35-page report, marked as classified, relies almost exclusively on Kremlin-linked sources. These include a senior Kremlin official, a senior Russian official in the Russian Foreign Ministry, and a former top-level Russian intelligence officer still active in the Kremlin. Law professor Ronald Rychlak, a leading expert on Russian disinformation operations, said the Trump dossier had all the hallmarks of a classic Russian disinformation campaign. “It does seem to fit with some of the crazy ideas that have come from the high levels within the Russian government,” said Rychlak, in an earlier interview. Steele’s defense attorney says in the court documents that Steele was instructed by Fusion GPS to brief reporters of The New York Times, The Washington Post, The New Yorker, CNN, and Yahoo News on the contents of the dossier. The briefings were done in person and verbally. Court documents filed by the House Permanent Select Committee on Intelligence showed that Fusion GPS had made payments to journalists who covered Russia related matters.